The Special Olympics is not just a sporting event that happens every few years. Many are not aware that this global charity not only organizes monthly events but also gives free health exams to athletes with intellectual disabilities. In 2013, The Special Olympics held more than 80,000 competitions and provided over a million free examinations. These events and health initiatives could never take place without the generous spirit of the community at large. Michael Brady Lynch, Esq. of The Michael Brady Lynch Firm is a yearly sponsor for various Special Olympics of Florida events, and this year he has donated $7,500 for the Jack in the Park event. Celebrating its 10th anniversary, Jack in the Park has raised over $1 million for Special Olympics athletes in the state of Florida. The event is a unique experience that features the finest Central Florida restaurants, premier entertainment, and a blackjack tournament. 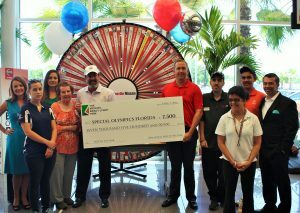 On May 10, Lynch along with his mother, Virginia; managing associate, Amy German; and media consultant, Robyn Lee, presented a $7,500 check to Rip Rice of Special Olympics of Florida and their Central Florida athletes. The presentation was hosted by another Jack in the Park sponsor, U.S. Marine, owner of Sutherlin Nissan on Colonial Drive in Orlando. Contributions like this strengthen the bond between local businesses and charitable organizations and inspires others to do the same.